Demonstrators protested on the streets of central London and in front of the Libyan embassy on Saturday in an anti slavery march that saw thousands join, including a strong youth demographic. The protest was one of many across European cities organised after CNN released a video of African migrants sold in Libya, which followed an investigation into the rumoured slave trade. In August, CNN claims it was sent an anonymous video depicting the auctioning of men for $300, $400, $500 dollars. In a grainy dark portrait frame, the camera moves from man to man, revealing a scene that is filled with horror and fear. The hard flash catches off the men’s eyes, “big strong boys for farm work” shouts the auctioneer, referring to the migrants in Arabic as “merchandise”. After receiving this footage, the newschannel began an investigation into its authenticity, and on November 13th CNN released its own footage of such auctioning – taking place at night in a village near the capital, Tripoli. The existence of slave markets of the modern day has reportedly been known for years prior this investigation’s publishing – there have been testimonies from the International Organisation for Migration and other humanitarian agencies – but with the brutality of the images released, a new wave of urgency has been erupted across the West. Thousands of migrants, many from West Africa, but large numbers from Eritrea, Somalia, Bangladesh and Sudan, are being held in camps on the Libyan coast, hoping to reach Europe on what might seem like the last stretch of their journeys to a better life. Little did they know, however, that the Mediterranean waters have their own complex politics, and crossing the waters is becoming tougher every day. 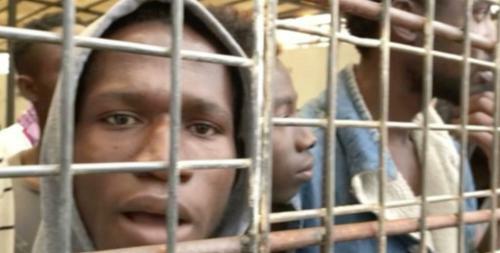 In a deal that saw the fall of migration into Italy by 80% between July and August, Italian Interior Minister, Marco Minitti, negotiated a deal with the Dabbashi militia who control three main detention camps for migrants in the Libyan port of Sabratha, a hub of human trafficking to Italy. Reportedly, the Dabbashi clan agreed to halt its extremely liquid smuggling business in return for political status and money. Following the deal, floods of migration coming into Italy and Europe more broadly have been reduced. Yet as a result, the “reduction in the number of boats leaving Libyan ports, combined with the successful blockade being mounted by the Libyan coastguard, is producing a backlog of migrants trapped in inhumane Libyan detention camps.” Says Matteo Villa, the head of the migration programme at the Italian thinktank Ispi. Since the CNN reportage infiltrated the social media feeds of thousands, 260,000 signatures have been collected to request the UK asserts pressure on the Libyan government in implementing zero tolerance to modern day slavery. Yet how the governments of Europe have themselves played a role in this has been left out of the conversation. Photo: Screenshot of CNN’s investigative video uncovering modern day slave auctions in post-Gaddafi Libya.